Commentary on prevention a possible drug-drug interaction: Is concurrent administration of orlistat and pioglitazone increase the risk of durg-induced hepatotoxicity? Background: Drug-drug interactions (DDIs) are an emerging threat to public health and are difficult to detect. To prevent DDIs and their burden, the possible DDIs should be kept in mind. We know that the obesity predisposes to the development of insulin resistance and type 2 diabetes. Therefore, combinational uses of antiobesity drugs and glucose-lowering drugs are very common. As the hepatotoxicity of both pioglitazone (an antidiabetic drug) and orlistat (an antiobesity drug) has been shown in some cases, the aim of this study was to evaluate the interaction of pioglitazone and orlistat in human hepatocellular cell line human hepatocellular carcinoma (HepG2) cells to determine their effect on liver toxicity. 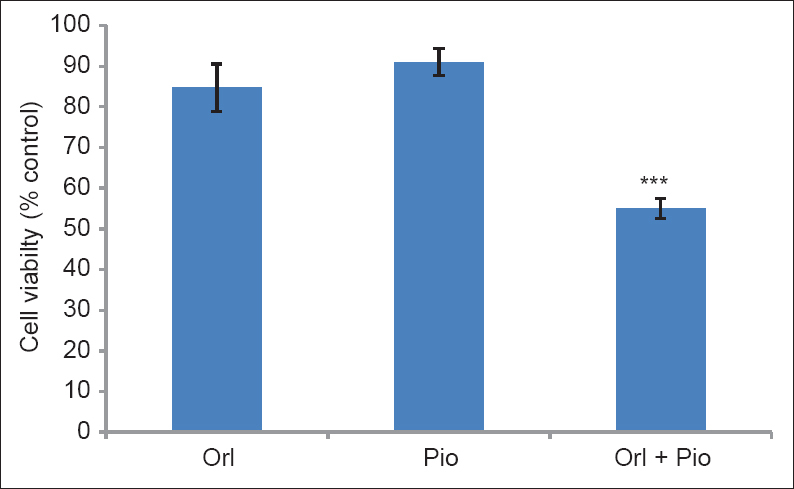 Methods: Human hepatocellular carcinoma cells were treated with 25 μM Pioglitazon (Pio), 20 μM Orlistat (Orl) pioglitazone, orlistat or combination of them. The MTT assay was used to assess cell viability. Results: Pioglitazone and orlistat combination caused a loss of HepG2 cell viability. While pioglitazone (25 μM) and orliatat (20 μM) alone decreased the cell viability around 91% and 85% respectively (notsignificant, P > 0.05), the combination of these two drugs reduced the amount of viable cells to 55% which was significant when compared with each drug alone (P < 0.001). Conclusions: Revealing the significant loss of viability of HepG2 cells in the combination use of pioglitazone and orlistat indicates these two drugs should not be administered at the same time to prevent their hepatotoxic effects especially in patients with liver dysfunction. To combat the dual burden of obesity and type 2 diabetes, concurrent use of pioglitazone and orlistat is expected. In many concurrent and combinational uses of two or more drugs, drug-drug interactions should be considered to prevent possible harmfulness of these drugs. As liver toxicity is a side-effect of pioglitazone, we aimed to see if in vitro treatment of human hepatocellular carcinoma (HepG2) cells with a combination of pioglitazone and orlistat has any effect on pioglitazone-induced liver toxicity. To the best of our knowledge, this is the first in vitro study showing the effect of a combination of these two drugs in comparison to the effect of each drug alone on human hepatocellar carcinoma cells. Human hepatocellular carcinoma cells were obtained from Iranian Biological Resource Center and cultured in DMEM supplemented with 10% fetal bovine serum (FBS), 100 U/mL of penicillin, and 100 U/mL of streptomycin. Cultures were maintained at 37°C in a humidified atmosphere containing 5% CO 2 and 95% air. MTT was used to test the viability of cells. HepG2 cells were seeded in 96-well plates (10,000 cells/well) in FBS-free medium for 24 h. Then cells were treated with 20 μM orlistat, 25 μM pioglitazone or combination of them. The drug concentrations were selected based on the experiments done by various concentrations of these drugs (the data are not shown) and the selected concentrations were close to the ones in clinical settings when these drugs are used in patients. Minimal concentration of dimethylsulfoxide (DMSO) (0.1% [v/v]) was applied to dissolve drugs. The control group did not receive any drug. After 72 h, 10 μl of MTT (0.5 mg/mL) was added to each well for 3 h. Then, culture medium was discarded, and 100 μl DMSO was added to each well. Optical density was measured at 570 nm and cell viability was expressed as a percentage of the untreated cells. All experiments were done in the Department of Pharmacology, School of Medicine, Iran University of Medical Sciences. Each experiment was repeated at least 3 times using different cell preparations. The ANOVA test, followed by post-hoc Tukey test was used to compare the groups. P < 0.05 was considered as significant. SPSS version 16 (SPSS Inc., Chicago, IL, USA) was used to analyze the data. The mean values (±standard error of the mean) of cell viability, in the HepG2 cells are presented in [Figure 1]. Although, 25 μM Pioglitazon, 20 μM Orlistat alone reduced viability of living cells to some extent (about 91% and 85% of control), but this was not significant (P > 0.05). Combination of two drugs significantly decreased viability of cells to 55% of control (P < 0.001). Several drugs are used for treatment of diabetic-related hyperglycemia and obesity. One of the problems in these patients is liver disorders. Therefore the effect of drugs on liver function in these patients is important. Despite poor absorption, orlistat can cause hepatotoxicity. Orlistat-induced hepatotoxicity risk is higher when orlistat consume with other toxic drugs. In the present study, concomitant use of orlistat and pioglitazone, increased the percentage of HepG2 cell death, although each drug decreased the viability of the HepG2 cells to some extent. Existence of PPARg in HepG2 has been confirmed. Both pioglitazon and orlistat are agonists for this receptor, ,, and there is the probability of synergism effect of these drugs. Although increasing these drugs dose may decrease the cell viability significantly, but in the concentrations used in our experiment, which are close to the concentrations when they used in human, they were not toxic to the cells in a significant manner. In summary, the results showed that although pioglitazone and orlistat were not toxic to HepG2 cells in vitro, their combination use would decrease the viability of cells significantly. As the HepG2 cell line is derived from HepG2, the cells could be used as a model for studying the hepatoxicity of drugs in the human. Based on the previous reports, we can extrapolate the human hepatoxicity of drugs in this model. Although there are some differences between in vivo and in vitro conditions, we could conclude that the combination of orlistat and pioglitazone may cause hepatotoxicity when they are used concurrently in patients. Of course, this is a preliminary work and more studies should be done to confirm these results. This suggests that the combination of pioglitazone and orlistat could increase liver toxicity of them and it is advised that concurrent use of them be avoided especially in patients with history of liver dysfunction. This study was a part of Master of Sciences Thesis for Miss Marjan Emzhik. The work was financially supported by research grant from Tehran University of Medical Sciences (Deputy of Education grant for Master of Sciences thesis number 143) and Iran University of Medical Sciences (Deputy of Research and Technology, Project code: 92-01-30-19145). Halegoua-De Marzio D, Navarro VJ. Drug-induced hepatotoxicity in humans. Curr Opin Drug Discov Devel 2008;11:53-9. Sumithran P, Proietto J. Benefit-risk assessment of orlistat in the treatment of obesity. Drug Saf 2014;37:597-608. Floyd JS, Barbehenn E, Lurie P, Wolfe SM. Case series of liver failure associated with rosiglitazone and pioglitazone. Pharmacoepidemiol Drug Saf 2009;18:1238-43. Tolman KG, Chandramouli J. Hepatotoxicity of the thiazolidinediones. Clin Liver Dis 2003;7:369-79, vi. Heck AM, Yanovski JA, Calis KA. Orlistat, a new lipase inhibitor for the management of obesity. Pharmacotherapy 2000;20:270-9. Borbath I, Leclercq I, Moulin P, Sempoux C, Horsmans Y. The PPARgamma agonist pioglitazone inhibits early neoplastic occurrence in the rat liver. Eur J Cancer 2007;43:1755-63. Motomura W, Takahashi N, Nagamine M, Sawamukai M, Tanno S, Kohgo Y, et al. Growth arrest by troglitazone is mediated by p27Kip1 accumulation, which results from dual inhibition of proteasome activity and Skp2 expression in human hepatocellular carcinoma cells. Int J Cancer 2004;108:41-6. Martin H, McGhie TK, Bentley-Hewitt K, Christeller J. PPARg as a sensor of lipase activity and a target for the lipase inhibitor orlistat. Lipids Health Dis 2013;12:48. LeCluyse EL. Human hepatocyte culture systems for the in vitro evaluation of cytochrome P450 expression and regulation. Eur J Pharm Sci 2001;13:343-68. Madan A, Graham RA, Carroll KM, Mudra DR, Burton LA, Krueger LA, et al. Effects of prototypical microsomal enzyme inducers on cytochrome P450 expression in cultured human hepatocytes. Drug Metab Dispos 2003;31:421-31. Guo L, Dial S, Shi L, Branham W, Liu J, Fang JL, et al. Similarities and differences in the expression of drug-metabolizing enzymes between human hepatic cell lines and primary human hepatocytes. Drug Metab Dispos 2011;39:528-38.